Pixel Hex Tileset 1.1 is out! 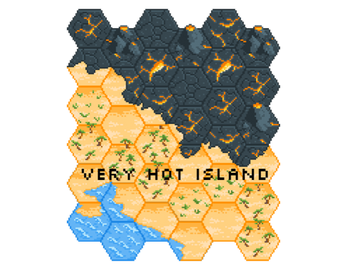 -Island demo files now available for free! -Read the full dev log here! 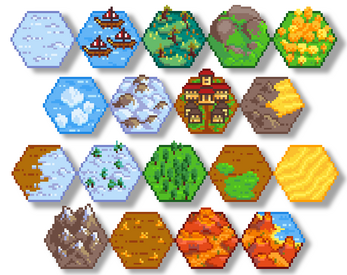 I'm proud to present the Pixel Hex Tileset, a 1206 tile pack that includes all you need to put together your own fantasy hex map in signature retro style! Tokens for points of interest, camping, battle, etc. The pixel hex demo, available exclusively for a limited time for Hex Kit backers, is now available on the store page for free. The demo is actually a stand-alone island map tileset. Grab a copy now! 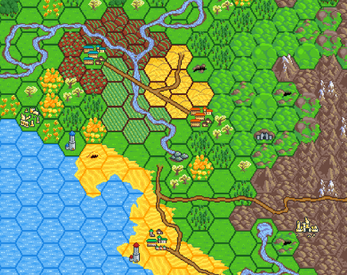 The Pixel Hex Tileset is compatible with Hex Kit 2.0, which supports flat topped hex tiles. The PixelHexTileset_HexKit zip file has all the tiles presorted in folders and is ready for import into Hex Kit. All you need to do is use the import tool in Hex Kit to select the unzipped folder, and then hit save without adjusting the images (Tiles may appear outside of the boundary but that's because things like mountains overlap the hex). 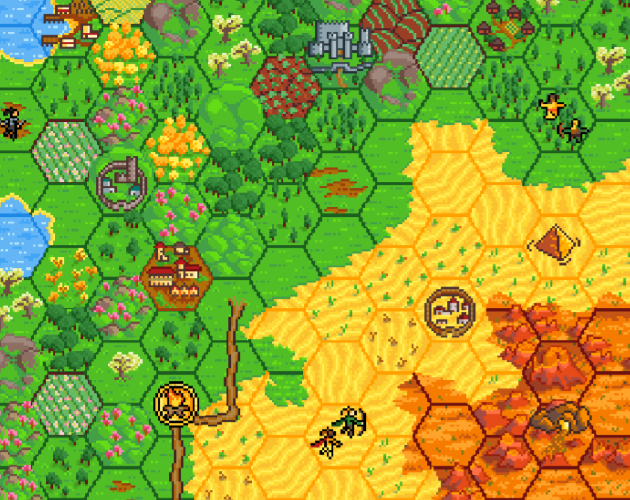 Pixel Hex Tileset 1.1 Out! Tile set is great, but I have noticed that the coast pieces are missing the left leaning diagonal half piece. Thanks for the feedback, I'll see about getting this rectified soon! Great kit! I posted a complete map on G+ using your hexes. I credited you with a link, but let me know if you want me to adjust the credits in any way. That map looks sweet! Good job! Recently updated the map for our ongoing campaign. Lots of admiration for your tileset over on G+. Thanks moconnor8! I really need to use google+ more, as I hear there's quite the ttrpg community there. I've definitely got some great press and feedback from that community. It's a great hub for the indie ttrpg world and I've never heard of anyone using it for anything else. Thanks for asking Ruxio. My license notes you can't use these tiles for commercial purposes. If you'd like to purchase a commercial license to use these tiles in a game, you can send me an email at zeshio.zworld@gmail.com. If you'd like to see a free or pay what you want tileset, let me know and that might be something I can work up for people. I could start out with something basic and as people support the cause I can add in more stuff. It's currently not feasible as an artist for me to offer 1200+ tiles for free+commercial license. Thanks for understanding! It seems grass coast tile 915 should be flipped (horizontally and vertically) as tile 912 already has that orientation. Thanks for the tile set, it's beautiful! Thank you! I'll make the fix and get the new stuff up this week too. Same thing on the dirt version (975), but the desert version's fine! Myrion, there should be a tile for each orientation so you shouldn't need to rotate them. The tiles weren't meant to be rotated, so I would strongly advise against that. (The pixels would be all wonky). You could get away with vertical and horizontal flipping on some tiles, but you might wind up with some weird tiles that way. Hm. Then I must've missed some, because I could swear I was missing some orientations. I know the Hex Kit folders can be a bit crazy, so you can always download the original folder just to confirm. The names should be the same regardless of if they're in the Hex Kit or in the regular Pixel Hex Tileset folder. If, on the off-chance I'm missing something, let me know and I'll get it added into my next update. It was my bad. I must've been too tired - I did miss some.